Laxatives for weight loss: Are they safe? Available in the form of pills or powder, laxatives basically pace up digestion process and also avoid recurrence of constipation by regulating bowel movements. However, a regular use of laxatives can be a serious threat to health as it excretes essential nutrients from the body at a faster rate. Laxatives are the best remedy for losing water weight. They are often prescribed twice a day to improve bowel movement. They are also capable of eliminating toxins from of the body. However, this is not at all an effective method to lose water weight as extended use laxatives is known to disturb a person’s overall metabolism and digestion process. Increased discharge of water from the body due to laxatives can also hamper with the energy levels of a person. Additionally, excess fluid loss can result in liver damage, multi-organ failure, and even death. Laxatives can cause both short and long term side effects depending on the usage. The effects can vary from person to person depending on their lifestyle and nutrition level. The short term effects of laxatives include nausea, vomiting, diarrhea, and bloating. These short term effects may go away as soon as one starts to take alternative medicines or just quits the habit of consuming laxatives. The long term side effects of laxatives include improper bowel movements leading to bleeding during defecation. Reduced water levels in the body can cause skin problems like freckles, pimples, or even permanent shrinking of the skin making it looked saggy and aged. Worse, laxatives can cause nerve impulses as they disturb the electrolyte balance in the body. They can also cause permanent damage to the liver and kidney. 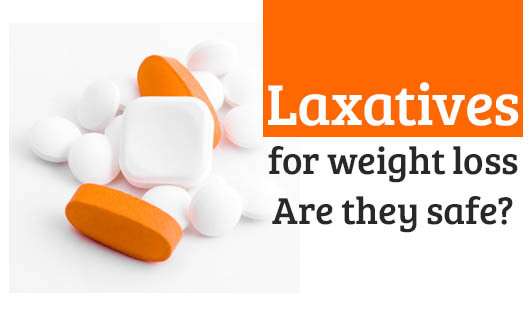 With so many side- effects involved, do you still wish you to opt for laxatives as an easy method for weight loss?